When refrigerant is still contained in a refrigeration unit, it requires a licensed contractor to remove the refrigerant into storage vessels. We call this "Recovery". Should you not have a preferred contractor to do this work, Refrigerant Supply Inc. will perform this service, or sub-contract this activity. Once the refrigerant has been recovered into portable storage containers, Refrigerant Supply will purchase the material directly from you. Do not make the mistake of allowing your contractor to keep or purchase your valuable refrigerant. They do not have the network of buyers that Refrigerant Supply has built, and usually don't offer a true market price. Again, upon recovery (removal) of your material into portable storage vessels, Refrigerant Supply will purchase your material. You may wish to stop reading here as the remaining information on this page is irrelevant to you, should you sell your refrigerant "as is" to Refrigerant Supply Inc. The remaining information on this page details what happens after that point. Should you wish not to sell your refrigerant, have it reclaimed and returned to you, or am just curious about what will happen next please read on. Once a refrigerant has been removed from a refrigeration unit, it will require purification. This is what we call "Reclaiming or Reclamation". For a recovered refrigerant to be sold in the open market, it is legally required to meet a set of regulatory purification levels. These standards are set by the American Refrigeration Institute (ARI). You can find these ARI 700 reclaim standards on our Refrigerants Reference page. If you possess refrigerant that has been removed from a chiller system, it is highly unlikely that your refrigerant will meet these analytical parameters. Should you still feel your material may pass this criteria, you can have your refrigerant tested by ISI (Integral Sciences Inc.). You will find contact information for ISI and ARI on our Refrigerant Links Page. Certain critical considerations are paramount when retrieving samples of refrigerant for analysis. A low pressure refrigerant is one which is a liquid and does not boil at room temperature. They are stored in non-pressurized regular metal drums, Low pressure refrigerants such as R-11, R-113 and R-123 can be contained in regular sample jars and sampled in open air. remember to have an absolutely clean jar as contaminations of water and oil are made to the part per million. 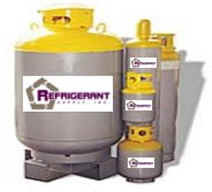 High pressure refrigerants boil at room temperature and require storage in pressured cylinders. I highly recommend against the layman attempting to sample high pressure refrigerants. It requires specially prepared sample cans, proper hoses and the proper valve fittings. It also requires a special line purging procedures. These are all required for high pressure refrigerant sampling as greater than 1.5% contamination with air will cause your analytical result to fail ARI standards. Beyond these difficulties, legally, only a licensed technician can perform this activity.